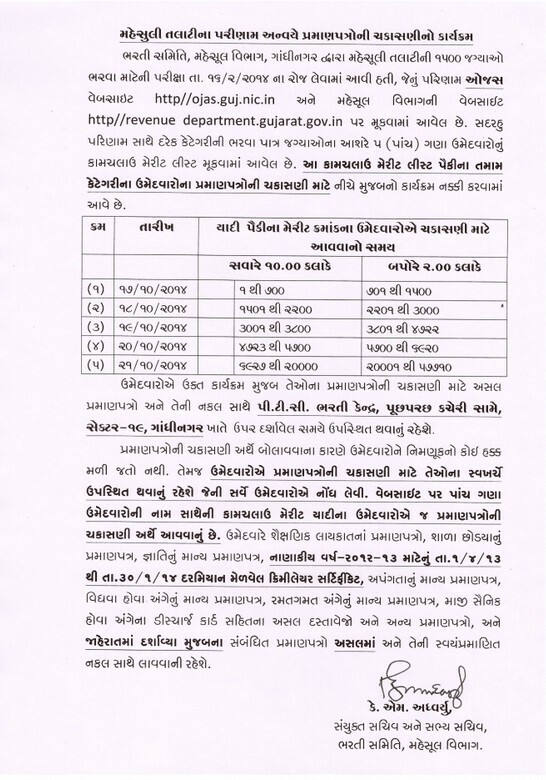 Revenue Talati Documents Verification Programme – Mahesul Vibhag, Bharti Samiti, Gandhinagar Dhwara Revenue Talati Ni 1500 Jagyao Bharva Mateni Examination Date. 16-02-2014 Na Roj Levama Aavi Hati, Jenu Results OJAS website ojas.guj.nic.in Ane Mahesul Department Ni website revenuedepartment.gujarat.gov.in par mukvama aavel chhe. Aa sathe darek category wise bharva patra jagyao na 5 gana candidate nu provisonal merit list mukvama aavel chhe. Aa list ma samavesh pamta tamam umedvarona Documents Verification mate niche mujabno schedule nakki karvama aavel chhe. Umedvaro ae time table mujab temna Documents Verification mate orignal ane zerox document sathe PTC bharti center, sector-19, Gandhinagar khate upasthit rahevanu chhe. Venue: PTC Bharti Centre, Opposite Inquiry Office, Sector-19, Gandhinagar.